Kevin M. Levin teaches history at Gann Academy in Waltham, MA. 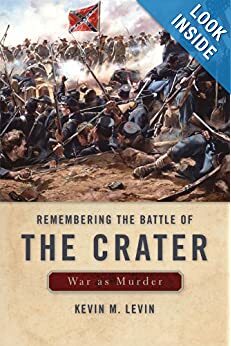 He is the author of "Remembering the Battle of the Crater: War as Murder" (2012) and blogs at Civil War Memory. On Wednesday July 3, thousands of visitors will congregate near the "copse of trees" on Cemetery Ridge at Gettysburg to commemorate the 150th anniversary of "Pickett's Charge." From this position they will be able to imagine the roughly 13,000 Confederates in tight formation, who crossed the deadly field in the face of long-range artillery. Once across the Emmitsburg Road visitors should have little trouble envisioning the deadly effects of short-range canister and the deafening sound of Union rifles. Some will contemplate the tragedy of a war that pitted Americans v. Americans while others will hold tight to thoughts of what might have been before accepting that the charge constituted a decisive Confederate defeat. The Brian Farm sits a few hundred yards from where Confederates managed to temporarily pierce the Union position on July 3. From here a very different narrative about the meaning of the charge, the broader campaign and the war itself confronts visitors. Abraham and Elizabeth Brian, along with their children were not present during the battle. Like other African Americans the Brians fled as news of Robert E. Lee's invasion spread through southcentral Pennsylvania in June 1863. Rumors of kidnappings by Lee's army -- itself made up of thousands of impressed slaves and personal body servants -- north of the Mason-Dixon Line served as another reminder of the precariousness of life for the region's black population. Blacks in the region were no strangers to the dangers of slave catchers, who followed their human prey north along the Underground Railroad. Confederate cavalry under the command of General Albert Jenkins took full advantage of those blacks, who were unable to flee the area. In Chambersburg Rachel Cormany watched helplessly as black women who were seized pleaded for their children to be spared. Lines that included entire families must have moved Rachel to tears as she clung to her own daughter. 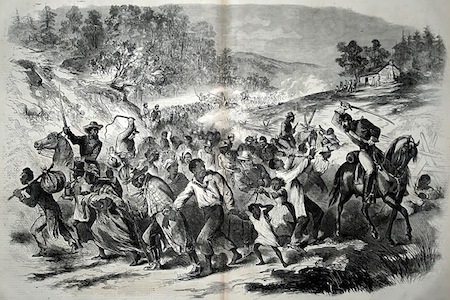 Black communities in McConnellsburg, Mercersberg, and Greencastle also faced the horror of being upended from their homes and families and forcefully marched south. In Mercersburg a woman by the name of Eliza and her child hid in a grain field and managed to elude marauding cavalry only to learn later that her daughter as well as her grandchildren were all captured. One member of Jenkins's cavalry recorded the routine of "capturing negroes and horses" sending them into Maryland and returning for more "plunder." Accounts suggest that Confederates made little attempt to distinguish between free blacks and former slaves. Kidnappings continued with the entry of Lee's three corps of infantry into Pennsylvania. While Lee issued orders to his men to exercise restraint in the confiscation of the private property of white Pennsylvanians there was no attempt to control the violence meted out to the area's black population. Indeed, it is likely that senior Confederate commanders sanctioned it. The army itself functioned, in part, on the labor of impressed slaves, as did military projects throughout the Confederacy. More broadly, however, the kidnapping of blacks by the army addressed the long-standing concern of slaveowners in the Upper South who worried about the gradual deterioration of slavery as a result of their inability to prevent their continued flight. Confederates in the summer of 1863 were engaged in nothing less than the securing of their border. Back in Gettysburg the African American community braced for the arrival of Lee's men. Some like confectioner Owen Robinson fled, as did Lloyd Watts, who was considered to be a pillar of his church community. It made no difference that both individuals were free men, who had legal papers to prove it. Randolph Johnson chose to stay and attempted to organize a "colored company" in response to the governor's call for local recruits. Though the regiment was not accepted into state service others took part in the defense of a bridge over the Susquehanna River on June 28 against 2,500 Confederate troops in defense of the state capital of Harrisburg. It is likely that the experience of some local blacks in a military setting subsequently led them to Philadelphia, which commenced with the recruiting of blacks into the Federal army just days earlier. In addition to Johnson, other black residents of Gettysburg chose to stay and were ultimately caught up in the confusion and horror that was visited upon the small community for three days beginning on July 1. At least one black woman, who failed to leave the town before Union soldiers abandoned it on the evening of July 1 for the ground of Cemetery Ridge, was forced to "cook and bake bread for the Rebels." The fear of abduction was a constant presence. One young boy witnessed, "a number of colored people" led away from their homes and friends, "crying and moaning." He caught the eye of his family's washerwoman, who cried out, "Good-bye; we are going back to slavery." Somehow "Old Liz" managed to escape and like others fled to the fields and other hiding places surrounding the town until the sounds of war dissipated. Four months later Abraham Lincoln paid a visit to Gettysburg to dedicate a new cemetery for those Union soldiers, who "gave the last full measure." His brief address called on Americans to see the war through to its end in the name of a "new birth of freedom." By then a number of black residents from Gettysburg and the surrounding region had returned and like others struggled to put the pieces of their lives back together and return to some sense of normalcy. Others chose not to return at the risk of what might happen if Confederates chose to push north again. An unknown number never returned to the area. The feint echoes of their voices should serve as a warning to those of us who in the early afternoon of July 3 will gaze out on the undulating fields between Cemetery and Seminary Ridge with a child's imagination of what might have been. We would do well to remember that the ebb and flow of the two armies leading to and from Gettysburg rippled through the surrounding countryside. For the unknown number of African Americans rounded up by the Confederate army, who called Gettysburg and the surrounding region home, Union victory mattered little. For them a new birth of freedom would have to wait just a little longer.